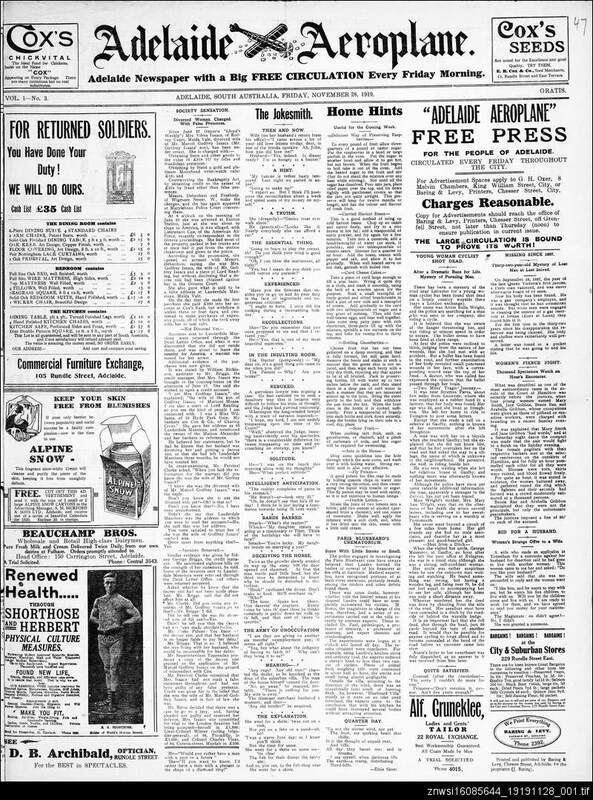 The single sheet Adelaide aeroplane was an early free newspaper. Its title reflects the popularity of the emerging aviation industry at the time. Probably an evening newspaper, it was largely devoted to horse-racing and contained a regular column titled, "Chapter of accidents, fatal and otherwise." The newspaper claimed to be "non-political" but tended to take a pro-socialist stance. Each issue contains a short story. The Adelaide aeroplane's short run finished in early 1920 due to power restrictions caused by a coal crisis. It was printed by G.H. Baring.